–Fireworks was said to have lit the sky as the plane touched down in pouring rain after a flight from Medellin, Colombia. 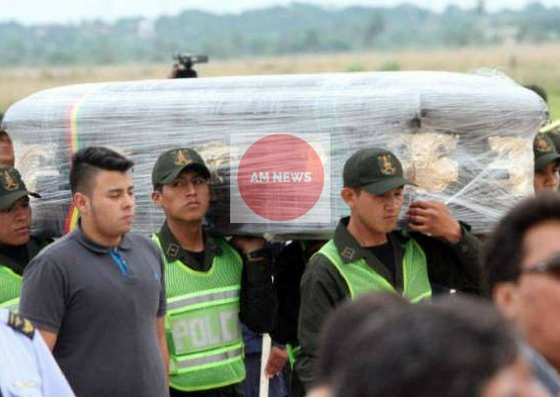 –Two Brazilian air force planes carrying the remains of a football team killed in a plane crash have arrived the country on Saturday, December 3. Two Brazilian air force planes carrying the remains of a football team killed in a plane crash have arrived the country on Saturday, December 3. Fireworks lit up the sky as the plane touched down in pouring rain after a flight from Medellin, where Cinderella-story club Chapecoense Real had been travelling for a big match when their plane ran out of fuel and crashed, AFP reports. The plane crashed on Monday night, killing 71 people including 51 players, coaches and staff. The victims will be laid to rest in a mass funeral in Chapeco in southern Brazil.